As the Donau winds from the Black Forest region and across Bavaria, it makes plenty of stops at some impressive and picturesque locations. 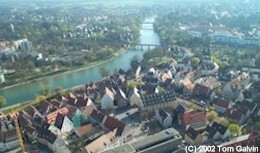 One of these is Ulm, the site of a ancient Roman fortress and now the home of the tallest cathedral spire in the world. Sitting near the provincial border between Baden-Wüttemburg and Bavaria, Ulm is a beautiful walled city that combines the industrial flavor of the former with the latter's flambuoyance. 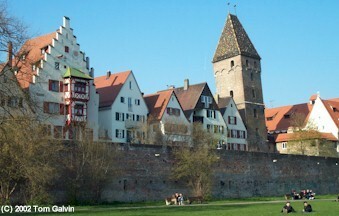 A large part of the city wall remains, shown above, serving both to protect Ulm from invaders but also floods. The top of the wall is wide enough for a walkway, easily accessible from the tall red-brick t ower to the right. This tower is a gate to the city from the river, and there are several nearby plazas. 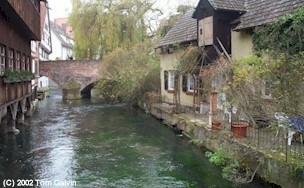 The old town is very picturesque with small well-dammed canals, red brick footbridges, and old stucco guesthouses. The picture at right is but an example. Just above the old town is Ulm Rathaus, the exterior of which is a gaudy painting telling the city's entire rich history (much like the Rathaus at nearby Lindau im Bodensee). In-between are several archaeological digs where viewers can see remnants of the ancient Roman fortress. There are two main shopping districts in the area -- the main one which is the old cobblestone district between the Rathaus and the train station, and Neu-Ulm, which is across the Donau from the old town. New-Ulm is very modern, but has several prominent Evangelical churches. 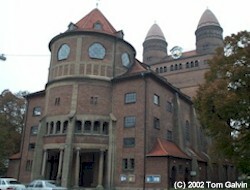 Ulm itself has prominent churches, such as Pauluskirche below, that towers above the nearby city cemetary. Of course, when you think about 'prominent', the Cathedral is the one. 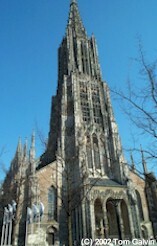 Unlike the famous Dom in Köln which is shorter but more massive, Ulm's cathedral is dominated by the front spire. For only a few DM, you can climb the 786 steps to the very, very top of the Cathedral. Ulm is a big place, and there's a lot to see between the various shopping districts, the maze of the Old Town, and all the churches and old buildings in the area, plus spend the necessary time enjoying a walk along the Donau River. For me, it was an excellent day trip.